Sites using social media as a cheap method to both promote and host their videos/photos/etc has been done before, Skittles and Boone Oakley are two mentioned here previously. Celebrities taking jabs at their image is also not new….but using James Lipton and his beard for PSA’s on mobile harassment is pure genius. 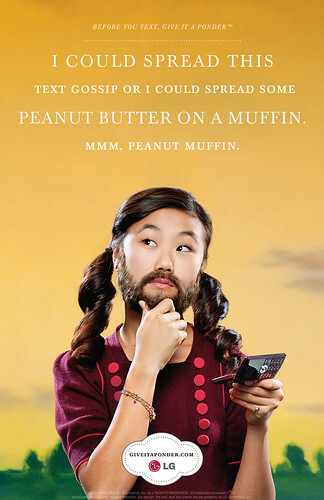 The Give It A Ponder campaign, sponsored by LG, is a mix of TV, print and web promotions all revolving around James’ beard and thinking before texting. The videos (featuring James Lipton) are campy, creepy, funny and to the point. The imagery and quirkiness leaves a lasting impression and the copy is so Lipton’esque that everything seems normal yet far from it at the same time. The print campaign is also humorous though not as powerful and may be confusing as to what it’s actually for. Still they’re eye catching and well related to the TV/Videos and Web experience. Who doesn’t remember Smokey the Bear, McGruff taking a bite out of crime, or the Crash Test Dummies (not the band)? These icons of pop culture were all part of the Ad Council‘s public service campaigns. See these and more from the Ad Council’s 65 years of service at Art Institute of Philadelphia’s exhibit “Advertising that Changed the Nation.” Which runs from February 11th to April 3rd, 2008 at the Art Institute’s gallery at 1622 Chestnut St., Philadelphia. Click here for more info. The fine image above was done by Ryan Katrina (Neuarmy) of the Neiman Group, whom are underwriting (read: paying for) the exhibit.